BOOK for 2019 with discounts and get the best weeks still available - Early bird offer! Casa Atlantida offers a super hillside location in Cerro Grande, just 1km west of Albufeira and a marginally over that from the picturesque little beach of Albufeira. Built in 2 levels, this is a spacious, bright and attractively designed villa of fine quality. Impressive and appealing furnishings adorn the lounge, including a modern two large piece suite around an ultra-modern glass coffee table. There’s a big screen satellite TV and a further sitting room with open fireplace. Loads of space is devoted to windows which access an ample terrace with lovely views across the valley to the ocean. The dining room leads onto the terrace. 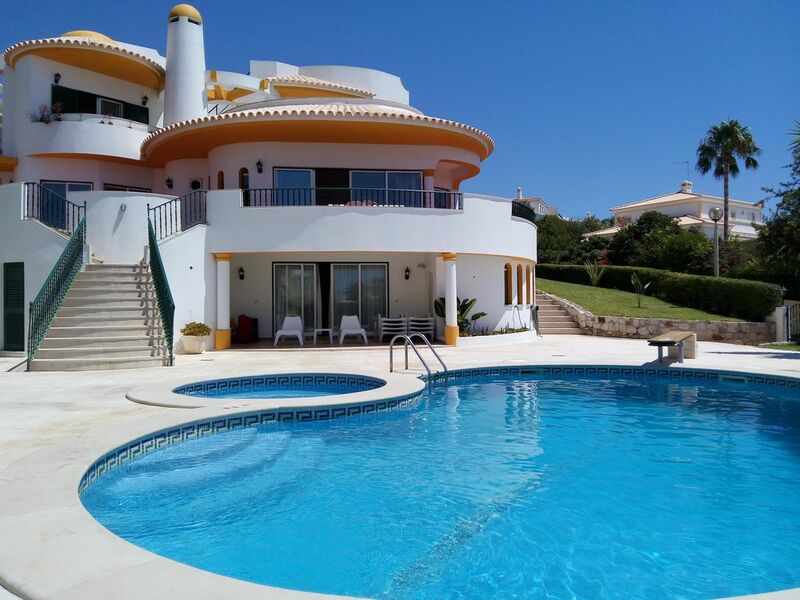 Large balconies surround the villa, one having a full sized BBQ area with seating and tables and all have fantastic views of the sea, Albufeira town and the new Albufeira marina. This villa is ideal for Large Groups. Free Wireless Internet provided. Staying in less than 7 days means that the minimum STANDARD RATE are applied (255 GBP per night) - independently of the chosen season. Two en-suite bathrooms with bath/shower and wc, second floor. One bathroom with bath/shower and wc, first floor. One bathroom with shower and wc, first floor. Impressive and appealing furnishings adorn the lounge, including a modern two piece large suite around a design glass coffee table. There’s a big screen satellite TV and a further sitting room with open fireplace. Loads of space is devoted to sea views. A fully fitted kitchen comes very well equipped with halogen cooker, a microwave oven as well as a conventional oven and grill, plus a fridge/freezer and washing machine, with the barbecue situated outside. Golf of Salgados, 1,5kms. Vilamoura Golf, 25kms. Thanks for your feedback - hope to see you in future. It was a pleasure to welcome you&familly. My friends & I have just had a wonderful stay at this beautiful villa in Alburferia. The villa is spacious and the outdoor pool area is fantastic. The walk into town as well isn't too far and there is a superb descent to the beaches and the Old Town. Our only main issues were the lack of different payment options (as cash for a large villa is rather tricky), some tripped electrics and our privacy as the owners did stay in the closed off bottom section overnight on the first night. However overall the trip to Albuferia was fantastic and we're all now big fans of the Algarve. Just an appointment: the owners did not Stay on the night - due to public electricity cut - we had to re-programme all automatic systems of the pool. And we could only set this at night. Overall it Was a pleasure to welcome you. The property is in a nice location but needs maintanence. We were insulted by the neighbour who gave us a rude gesture when we were admiring the view from the patio. As you must be aware we cannot answer by other poeple's attitudes. We tried to meet your criteria and offered a huge discount (though we we're not even obliged to), so we cannot understand this point. Either way it Was a pleasure to welcome you and hope to see you in future. Thanks for tu your important feedback. Thansk for your nice words - it was pleasure to welcome you. Hope to see you in future! All the beste to you&familly! Tnaks you so much for the feed-back - you were a stupendous party!! Hope your wife started to enjoy parcimons. We have stayed the present August in Villa Atlantida. We had a superb time there as we were there in a party of working+ familly friends. The villa is very beatifull, with nice gardens and the basic fittings. I would suggest to add a kindergarden for kids as an additional offer and to check outside plastics and with sun and use come to be light "rusted". Pool is brutal. Oustside the villa you have the nice bar/restaurant of Hotel Cerro Marina and the local supermarket - Intermarché - though easy accessed is a bit pricey! All the check-in and out process was accompained by the friendly owner - Alexandre - who even offered us home figs (the sun local fruit) upon arrival day. We had overall a very nice period and hope to come for the NY. Albufeira the best touristic spot in the South of Europe! It was a pleasure to welcome your nice friends also. About plastics we are constantly renewing them but sea, sand, sun and pool chlore are bad keepers. Will check this issue carefully. Reg. ...and of course if you come for the NY we will be pleased to offer you a discount. You are 15 minutes of walking distance of Albufeira Beach. 7 minutes car distance of Galé, Salgados, etc. The nearest Beach is less than 0.5km. Marina is less than 0.5km. A little further afield there there is a good selection of good beaches running both to the east and west from the town...Praia de Balaia, São Rafael, Praia de Castelo, Praia de Falésia, Praia de Galé, de Olhos d’Agua, Praia de Maria Luisa being the main ones. Faro is the next airport. 40 minutes by car. Due to villa location car is not needed. You are located in Albufeira Centre. Nearest golf course is 0.5km to 1km. Nearest Supermarket is less than 0.5km. Nearest Zoo is 4km to 4.5km. First and foremost, Albufeira is famed for its beaches, for the countless shades and tones of its rocks and cliffs. This is a place where people live to the rhythm of the great holiday destinations, sunbathing during the day and at sunset flocking to enjoy the restaurants, bars and discos that enliven the night-time hours. Just a few miles inland and everything changes. The green of the countryside is dotted with almond, fig, orange and pine trees and decorated chimneys stand out against the ochre of tiled roofs. Albufeira boasts beaches where the sand is fine and the sea a turquoise blue sheltered by cliffs which are canvasses painted with a whimsical palette of natural hues. It is for its beaches that Albufeira is internationally renowned, because all of them are different...and they are all equally enchanting. Nightlife, sunshine, beaches and lots and lots of animation are just some of the guaranteed features of Albufeira. Bucolic villages invite you to experience a way of life rooted in the tranquility of nature, to add another dimension to your holidays. Here the life has the rhythm of a tourist metropolis and, as the sun goes down, meet the sun lovers at the many discos, restaurants and bars. Sports are also a good reason to come and stay in Albufeira. Tennis, golf, water sports and much more make the delights of the most demanding sportsmen. Booking Notes: Staying in less than 7 days means that the minimum STANDARD RATE are applied (255 GBP per night) - independently of the chosen season. Payment is by bank transfer in sterling or euros. 20% deposit on booking and the balance 1 week before arrival. Full terms and conditions on booking or on request. Other tariffs can be arranged depending on special conditions. Start Booking for 2018 and get the best weeks! Changeover Day: Changeover days are preferable on Saturdays or can also be flexible - please ask. Notes on prices: This villa books early, check availability before query.